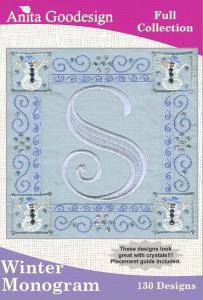 This monogram will look absolutely beautiful on anything you embroider this season. The designs look perfect on both clothing & home decor items. There are 26 different frames in two sizes. The sizes are 4"X4" & 5"X5". The included alphabet is in two sizes as well. Why did we do the designs separately? So you can choose your favorite frame & match it to the appropriate letter. This collection is totally custom! If you're a crystal lover you are going to have fun with these designs.